The story of how the women’s rights movement began at the Seneca Falls convention of 1848 is a cherished American myth. The standard account credits founders such as Elizabeth Cady Stanton, Susan B. Anthony, and Lucretia Mott with defining and then leading the campaign for women’s suffrage. In her provocative new history, Lisa Tetrault demonstrates that Stanton, Anthony, and their peers gradually created and popularized this origins story during the second half of the nineteenth century in response to internal movement dynamics as well as the racial politics of memory after the Civil War. The founding mythology that coalesced in their speeches and writings–most notably Stanton and Anthony’s History of Woman Suffrage–provided younger activists with the vital resource of a usable past for the ongoing struggle, and it helped consolidate Stanton and Anthony’s leadership against challenges from the grassroots and rival suffragists. 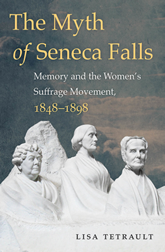 As Tetrault shows, while this mythology has narrowed our understanding of the early efforts to champion women’s rights, the myth of Seneca Falls itself became an influential factor in the suffrage movement. And along the way, its authors amassed the first archive of feminism and literally invented the modern discipline of women’s history.